Bingo! Great buy on a buffer - time to step up the output ! I think it will make things quicker but also a better quality. I try to do every pipe as if I was adding it to my collection. I ordered 3 buffs with 2 compounds and wax from The Beall Tool Co. I'm anxious to see the difference in my work. 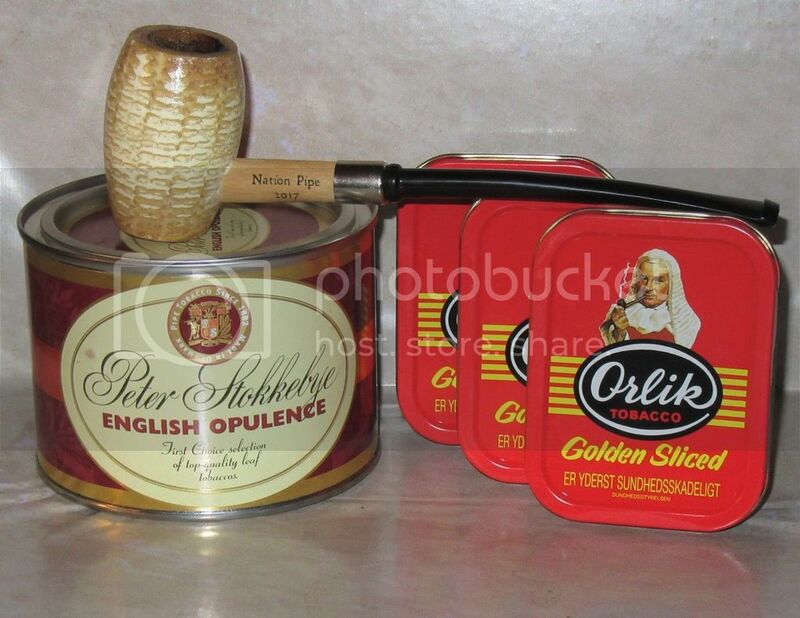 Yesterday, while attending the Upstate Pipe Club meeting, I was able to get some NOS tins or Orlik Golden Sliced with at least several years of age in them as well as a tin of PS English Opulence. My B&M found an old shipment in their storeroom that dates back a while. I sampled a flake and decided to get three tins. I also sampled a bowl of the Opulence, it has been discontinued for a while. Lets just say some age can make a so so blend something special. Nice find!! I have the smooth Bulldog with the carbon ring. Nice smokers!!! Enjoy!!! Not that I need any more pipes...but I snagged this Johs on Ebay for $46 shipped. That is about half off retail for a Johs. I am very happy with my other Johs, and think I got a great deal on this one. I am glad I upped my bid by a couple of bucks in the last minute, or I would have missed out. Great smoker!!! Enjoy it. I enjoy mine often!!! I guess Johs pipes are kind of like Lay's Potato Chips for me...I just can't stop at one. This is waiting for me in my mailbox when In get home. That is my third Johs. Sad thing is I may not be done. There are a few others I have my eye on. There is a good chance I will end up with a Sandblast pipe in the next week or two as well. I did end up with another one. And it is a sweet smoker too!!! Great smokers too. Johs makes a nice pipe for the money. I grabbed them on Ebay for about $50 each. Highly reccomended.